A faulty onboard storage battery has been identified as the possible cause of the fire that broke out on Shanghai's magnetic levitation (maglev) train on August 11. Investigations conducted by Chinese and German technical experts show that the mainframe and parts of the carriage damaged by the fire were "basically in good condition," according to a spokesman with the Shanghai Maglev Transportation Development Company (SMTDC), the train operator. "The experts are now casting their doubts on the faults of the on-board storage battery," he said. The maglev was driven away on Thursday evening from an emergency stop on the track about one kilometer away from the Longyang Road Station where it was berthed. 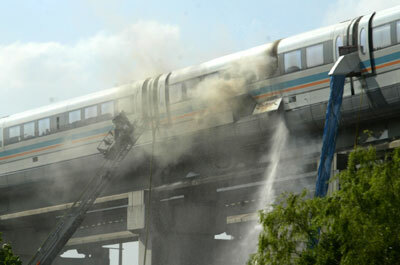 The German-made maglev train caught fire at about 3 p.m. on August 11, but no one was hurt. Smoke started rising out of the second carriage as the train was leaving the station bound for Pudong International Airport. Firefighters were mobilized and passengers evacuated. As the fire did not cause any serious damage, the continued operation of the other maglev trains has been smooth, Xia said. Experts from German company Transrapid International (TRI), the technical provider of the Shanghai maglev train, joined their Chinese counterparts in investigations into the cause of the fire. The maglev went into operation on December 31, 2002. The maglev line is 30 kilometers long.